Here’s some new Djs From Mars. Their bootleg remixes are absolutely amazing. I’m always shocked by the awesomeness that they can compact into a 3-5 minute masterpiece. This newest one is a mashup of Rihanna’s “Only Girl (In The World)” and Faithless’ “Insomnia”. Of course, it’s stunning. “Only Girl” was good enough on it’s own, but here’s a great party version. Djs From Mars really never cease to amaze me. They mix top 40 songs with unexpected oldies. This first one is a mashup between Guns N’ Roses’ “Paradise City” and Eminem & Rihanna’s “Love The Way You Lie”. So odd that this mix works, but it really does. Now this one….is incredible. Britney is one of my top 10 favorite people in the world…And this mashup features two of her most epic songs, “Baby One More Time” and “Toxic”. So amazing. Hail to the queen. New Djs From Mars! Very interesting combo. I wasn’t 100% sure I liked this upon first listening, but then came to the conclusion that it is awesome. I think Djs From Mars do a great job with these Bootleg remixes, they’re always so fun to dance to. Also, “California Gurls” is epic this summer, so I would’ve been surprised if they didn’t mash it. As usual, great job Djs From Mars. PS if you’re only in it for the Spice Girls, jump in around 44:45. More awesomeness from Djs From Mars. I’m so sick of “Alejandro” to the point where I felt the nickname “lolejandro” was necessary, but this is a really cool mashup. It’s disgusting of me to admit this, but I love Mamma Mia, so I love Madonna’s song “Hung Up” (it samples “Gimme! Gimme! Gimme! from Mamma Mia)… I looove the intro to this song, it really draws you in. I’ll post more songs tonight, I’ve been so busy and I know I’ve been slacking but… I have a blog – which means I’m so lazy that I’m sitting on a couch writing this, so I’m obviously a huge slacker. But I’m gonna pick up the pace I swear. Lots going on in internland, which is a good thing! Deets to follow. EAR NOMS!!!!!! I’m gonna cry I’m so happy about all of these remixes. If you’re planning to rave this weekend, download all of these, now! Do it! ^ “Sweet Dreams (Djs From Mars Bootleg Remix)” – Beyoncé Vs. Eurythmics – AWESOME. ^ “Are You Gonna Go So Fine (Djs From Mars Bootleg Remix)” – Sean Paul Vs. Lenny Kravitz – I HATE Sean Paul and I LOVE this song. That’s what a great DJ does – make a remix that’s so good you forget why you hate the original artist. 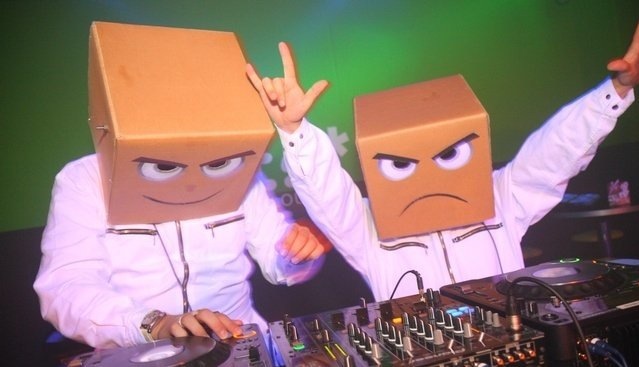 ^ “Teenage Dirthouse (DJs From Mars Remix)” – Patric McFly Vs. Wheatus – Who doesn’t love Wheatus!? ^ “Womanizer (DJs From Mars Remix)” – Britney Spears. Last but not least – I LOVE BRITNEY SPEARS!! Sorry for this excess of remixes but sweet lord Djs From Mars are awesome! Dj Pyro is in vile danger of losing the title of Jillboard’s Favorite DJ! VILE. DANGER. Good point! No one ever gives DJs the respect and decency they deserve. I am a strong believer that it is the DJs that make the music industry. Who breaks those hit records you hear on the radio? Oh yea – the DJs. This is a fun song, and guess what? I GIVE A F**K ABOUT DJS!